Modern Western medicine can achieve some true miracles—like transplanting a heart or removing a brain tumor. But when it comes to easing the discomfort of minor injuries and aches, conventional over-the-counter ointments may not help as much as you would like. So, why not consider some herbal remedies that have provided healing help for thousands of years? Traditional Chinese Medicine (TCM) offers natural topical remedies that can soothe joint pain, sprains and minor burns and promote healing. Some TCM herbal remedies are simple enough for you to make and use at home (though for any serious injury or significant ongoing pain, you should see a health-care professional first). The recipes below were provided by Daisy Dong, LAc, OMD, a licensed herbalist and professor at Southwest Acupuncture College. Ingredients for these remedies are available at many herbal stores and Asian markets as well as online (Dr. Dong recommended Spring Wind Dispensary). 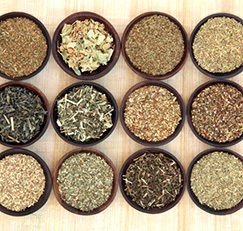 Ask for the herbs by their Chinese names and/or their Latin or common names. Herbs often are measured in grams, so you may want to invest in a small kitchen scale… or, in most cases, you can use the familiar teaspoon, tablespoon and cup measurements that also are provided. Important: These are topical remedies, meant to be applied directly to the affected area. Do not ingest them! Used as directed, they have no side effects. To prepare: Place the hong hua into a container that has a tight-fitting lid and pour the alcohol over the herb. Cover and refrigerate for one week. Strain the liquid through cheesecloth, removing and discarding all solid remnants of the herb. Store the liquid liniment, tightly covered, in the refrigerator for up to three months. To use: Up to four times per day as needed, soak a cotton ball or gauze pad in the liniment, then rub on the aching joint. Avoid getting the liniment on your clothing as it may stain. To prepare: In a container, combine all herbs (not the egg whites) and mix together thoroughly. Cover and store this powdered mixture in a dry place until ready to use. When the remedy is needed, combine 6 g (11?4 tsp) of the mixed powder with one fresh egg white and stir to form a pasty salve. To use: Rub the salve on the affected area, cover with gauze and leave on for one to two hours. Apply once daily until pain is gone. Avoid applying to skin that is broken or cut. To prepare: In a frying pan, fry the raw, sliced dang gui with the sesame oil for several minutes until the herb turns blackish and the oil changes color. Remove from heat. With a slotted spoon, remove and discard the dang gui. Add the beeswax to the hot oil and stir quickly until completely mixed. Pour the mixture into an oven-safe container and place in a 200°F oven for about one hour, stirring mixture two or three times as it bakes. Toward the end of the baking time, check the consistency by placing a small amount of the mixture on a metal spoon and putting it in the freezer for one minute—ideally, it should be soft and pasty (no longer watery but not yet hard) when mixture is the proper consistency. Remove the mixture from the oven and stir again to mix well. Let cool, then transfer to a glass or metal container. Cover and store in the refrigerator for up to nine months. To use: Spread 1 Tbsp. of salve on a gauze pad and apply to the burned area, changing the dressing once or twice daily, Dr. Dong recommended. Repeat applications until the burned tissue heals. Source: Daisy Dong, LAc, OMD, is a licensed herbalist and professor at Southwest Acupuncture College in Boulder and a senior acupuncturist at The Center for Integrative Medicine at University of Colorado Hospital in Aurora. Dr. Dong received her medical degree from the Beijing College of Traditional Chinese Medicine, where she also practiced and taught for 26 years.